Burberry has launched Burberry Her Blossom, a new flanker to 2018's Burberry Her. Bright and energetic, Her Blossom is a love letter to London in bloom. A walk through sunshine-soaked parks and down blossom-covered paths, it's the embodiment of the Londoner’s attitude in those first few days of spring – high-spirited, spontaneous and full of anticipation for the season ahead. The gourmand signature of the original Eau de Parfum wrapped in luminous plum blossom notes. Sparkling mandarine [sic], creamy sandalwood and comforting musk notes convey warmth and depth. Burberry Her Blossom was developed by perfumer Francis Kurkdjian. Additional notes include pink pepper and peony. 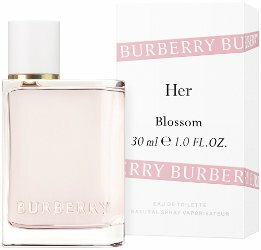 Burberry Her Blossom is available in 30, 50 and 100 ml Eau de Toilette. Well, aren’t things just blossoming for spring this year? Ha, yes! Floraling and blossoming all around. Bottle looks Prada-ish to me? Maybe I haven’t looked at Burberry in a while. Yeah, it’s the same bottle they used for the original Her. These notes do not sound spring like! Where are the flowers? Maybe an aquatic note ? Too much to hope for. It just sounds basic like a Victoria’s secrets body spritz. To be honest, Burberry’s entire rebrand has just been toe-curlingly basic. I guess the flowers are the plum blossom and peony.